Puts your hand in the comfortable relaxed handshake position. Eliminates Arm Twisting The patented shape supports your hand in a relaxed handshake position that eliminates forearm twisting. You will quickly become accustomed to the improved comfort. An ordinary horizontal mouse requires your forearm to twist away from its natural position. The mouse does not move sideways when clicking with normal force. Pointer control is as accurate as any other good mouse. Reduces Hand Movements 1200 dpi true optical resolution sensor moves the pointer quickly to reduce hand movements (by dave tf support). 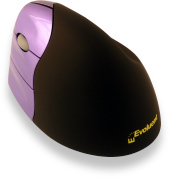 The pointer can be moved across a 17" monitor with only 1/2" (13 mm) movement of the mouse. 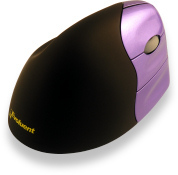 Most other mice have 400-800 dpi and require more hand movement. Easy Clicking The button force is light for easy clicking, but still firm enough to avoid accidental actuation. Vertical scroll - press a button and drag the mouse to scroll with greater precision and control than the scroll wheel. Auto click - automatically perform a double click by pausing the pointer. Adjustable time delay for activation. Click lock - press and hold a button momentarily to simulate continued pressing without holding down the button. Adjustable time delay for activation.